On our day walking around in Krakow we was "blessed" with a complete washed out sky - so instead of the dull white I added here a coffee filter for a more interesting result. The main square of the Old Town of Kraków, Lesser Poland, is the principal urban space located at the center of the city. It dates back to the 13th century, and at roughly 40,000 m² (430,000 ft²) is the largest medieval town square in Europe. The Project for Public Spaces (PPS) lists the square as the best public space in Europe due to its lively street life. The main square is a rectangular space surrounded by historic townhouses (kamienice), palaces and churches. The center of the square is dominated by the Cloth Hall (Sukiennice), rebuilt in 1555 in the Renaissance style, topped by a beautiful attic or Polish parapet decorated with carved masks. On one side of the cloth hall is the Town Hall Tower (Wieża ratuszowa), on the other the 10th century Church of St. Adalbert and 1898 Adam Mickiewicz Monument. Rising above the square are the Gothic towers of St. Mary's Basilica (Kościół Mariacki). 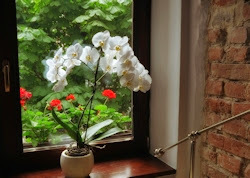 To the left - beautiful orchidee in our hotel room window.